Google Calendar is an essential tool for organizing your time and sharing your schedule with friends and coworkers. But what about letting others know about your preferred availability? Likewise, when you look at a business's online calendar, do you wonder why you can't just book an open slot instead of remembering to call during regular business hours? Now, with appointment slots in Google Calendar, any individual or business can manage appointment availability online 24/7. 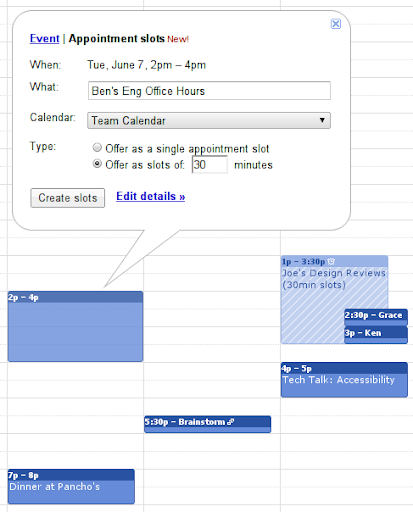 To get started, set up blocks of time you’d like to offer as appointment slots. Simply click anywhere on your calendar and then on "Appointment slots.” From there, create a single block of time or automatically split a larger block of time into smaller appointment slots. Every Google Calendar has its own personal appointments sign up page; you can embed it on your website or give the URL directly to friends and clients. You can find the URL for your appointment page at the top of the set-up page, which you can access via the Edit details link. When someone visits your sign up page, their calendar is overlaid for convenience and they can sign up directly for any available appointment slot. 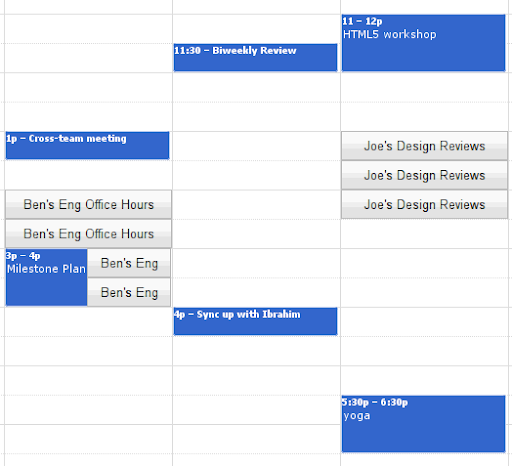 When they sign up, Google Calendar conveniently creates a new shared event on both of your calendars. 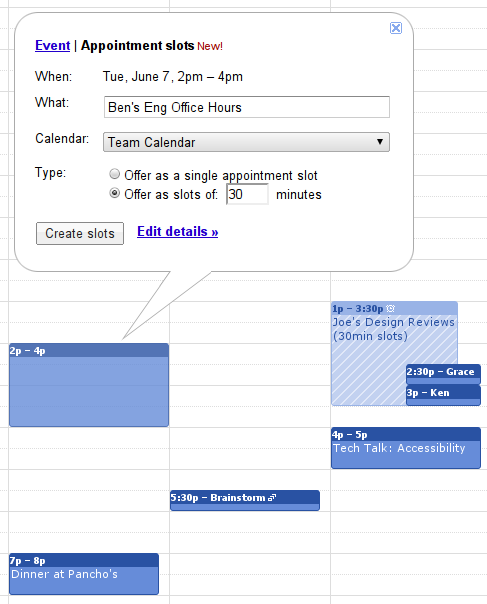 At Google, many people are already using appointment slots to manage their office hours. Appointment slots is starting to roll it out widely today, and appointment slots should be available for everyone within the next few days.